While packing for my month in Italy, I came across this great post with tips and tricks on how to pack a capsule wardrobe, or a month’s worth of outfits in one small suitcase with as few items as possible. After actually living out of a suitcase this month, I decided to post my own checklist for packing for a month at the beach. The first step to packing this suitcase is to pick out your basics. I brought along my favorite skinny jeans, a few tops that I wear often, and a couple of pairs of shorts I like. As I was getting dressed every morning, though, I realized I needed to actually have a pair of dark shorts and a pair of light shorts – not the denim and blue that I had brought along. A quick trip to H&M solved my problem, however. Just make sure that everything you pack is something you enjoy wearing and feel comfortable in… otherwise you’ll realize three days into your vacation that you have nothing to wear! After you’ve picked out the basics, you can move on to picking out your interest items. Focus on colors and textures to pair with your basics and make your outfits more interesting. I chose a color scheme to make sure my outfits all sort of tied together. In the picture I used mainly mint and coral, and in my actual suitcase I packed mostly shades of blue. As for the swim suits, only bring pieces you can mix and match. Chances are you’ll get tired of wearing the same two or three suits, but if you can mix different tops with different bottoms, you’ll have a new suit every day of the week! The last step to your capsule wardrobe is accessories. This next part is very important, so pay attention… Bring two purses! Seriously. Trust me. It’s awesome to have a huge beach tote to throw all of your stuff in while you soak up the sun, but it is equally as essential to have a smaller purse for just your phone, wallet, and lip gloss when you go out on those warm summer nights at the beach. So just do it. Take two purses. As for accessories, I recommend taking 2 different pair of earrings and two different necklaces, and then 4 pair of shoes – sneakers, flats, flip flops, and nicer sandals. 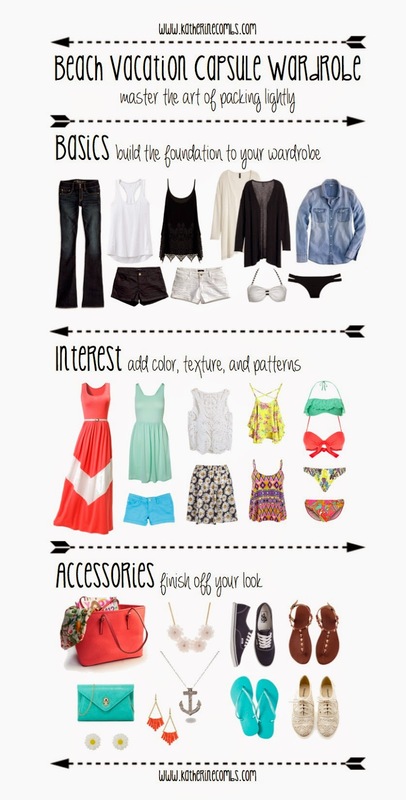 Also consider taking a belt (only if it works with more than one outfit), some bracelets, or a scarf or two. If you’re anything like me, you’ll want to go for a run or work out at least twice during your month long vacation, so you should probably pack for the occasion. I brought running shoes, 2 sports bras, 2 athletic tops, and one pair athletic shorts, and I definitely do not regret the space they take up in my suitcase. Sometimes I just need to go for a run. Also think about taking some loungewear, or stuff to just wear around the house. I brought leggings, a nice hoodie, some pajama shorts, and a tank top just to have for lazy days or rainy days. If you want to download the packing list for this capsule wardrobe, see all of the outfit options, or just have the print out, you can click here to download the .pdf from Issuu. I was trying to print out the packing list of the capsule wardrobe and the link takes me to a spam link. Do you have the link for the beach wardrobe 6 pages? Do you have the link for the 6 pages? They look like they would be pretty useful.